Greg Powell one of the most reputable horse trainers in Australia displays his passion for feral horses and the process of breaking them in. Starting at the beginning of the video, Greg narrates explaining the nature of these wild animals in the Tinderry ranges. Roaming free, the last remaining horses are slowly tamed for use. Powell displays his respect for the animals by slowly wearing them in and getting them accustomed to the presence of man. So is the feature any good? In my opinion, some may find it interesting whilst others may generally dislike it. The handling of the horses is done gently and carefully but it is so slow and dull in execution that if one were not a horse aficionado, would not appreciate. Coming from a farming background including horse riding, which was forced onto me at a young age seeing this feature was seen to be more a threat than its intended appeal as an entertaining experience. Seeing the film from a horseman�s point of view I would understand that it would be an interesting and insightful study into horse behaviour and interaction between man and animal. After a slow start that involved the creation of some yards for breaking in the wild horses. Greg rounds up the horse �Snowy� a spirited and strong horse which Greg pointed out as having the most potential out of a mob of five. With care and non-threatening demeanour he slowly brings the horse to yield and bring about it�s eventual succumbing to the reins of the horse Handler (Powell). The aim of �breaking in horses� is to show the horse that the trainer is the leader regarded with equal respect and reverence. 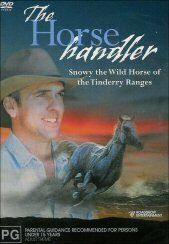 The part where Greg trains Snowy is interesting and illustrates the art of horse handling to people keen on this discipline. Snowy being a highly spirited animal that she is took a few days to tame. After all when she was in her herd she took the lead in the pecking order even over the stallions of the mob. Powell tells the story blow by blow and tells exactly what is going on in the horses mind. His task is to unlock the secrets of the horse�s mind and surface the potential, hidden by the feisty exterior. The extras are a little hit and miss. The show at the Equitana where Greg is showing the animals trust in him by attempting potentially dangerous manoeuvres such as crawling between the horses legs and running around with a tarpaulin brandishing it to the horse including the audience watching. The amusing part is where Greg is trying to control a Kelpie called �Bruce�, which mischievously does not do what it is told. Greg explains to the audience that �Bruce� is a working dog but watching him perform I�d doubt he�d be much use on a farm. With a sea of admiring onlookers laughing at Bruce it is understandable his given behaviour. The other Extra �Preparing to start (to break in a 2 yr old)� is an interesting addition especially for those who identify with this field of work. Overall if you are interested in Horse husbandry definitely see this, you will be amazed at the precision of control that Greg displays. Anyone else who is horse crazy as some people are, would undoubtedly love this feature. People who are not appreciative of these animals would not enjoy it, personally I thought it was not as appealing as a dog training video or anything smaller with personality. The slow direction and sleepy production values may turn some people off. Lucky the main feature is short about 46 minutes so if viewing the film with a horse enthusiast the pain is short lived. Preparing to Start (Break In) your 2 year-old.